What is life like when you are a working mum? Busy, I can tell you. Life does suddenly become so much more hectic when you have kids... I do wonder what did I do with all my time before I had a baby, really, what did I do? Because now, my life feels like it is pretty full-on most of the time. I wanted to do a weekly capture of my life, as it is at the moment. Busy, lots of things happening, even if it is mostly commuting to and back from work. So here it is - my week Monday to Sunday. 6:00AM Wake-up. My husband has decided to begin a new gym routine and gets up at 6AM, waking me up too. I doze until 7AM, and then get woken up by my daughter and we cuddle in bed, reading a book. I make breakfast and lunch and head to work at 8:15AM. 9:30AM - 5:50PM As I arrive to work, I am feeling exhausted already. My inbox contains a big stinking data bomb request... Welcome multiple Excel sheets and pondering how to model a bunch of financial stuff. Thankfully I have a session on mindfulness and a yoga class to break up the day. I grab Gone Girl for a commuting read from our workplace communal library. 7:00PM I am back home, and slump on the sofa. 8PM I go and put the little monkey to bed, but she is sniffly and I spend a long time cuddling her and trying to get her to sleep. After eating I go on the computer, but forget to update my blog. 11:00PM Off to bed after tidying up for the next day house viewing. 7:15AM Wake-up after a very badly slept night - a toddler with a cold would do that to you. I make my lunch and head to work. 9:30AM - 5:50PM I have a couple of meetings during the day, and go to a data analysis seminar during lunch. Plenty of things to do so the day goes fast. 7PM I am back home and we eat dinner (tasty chili con carne) and put the sniffly girl to bed at 8:30PM. After which we watch telly (Queens Big Night Out documentary) and I blog a little, writing about our home. 12:30AMish I get to bed. Too tired to go to sleep, you know, one of those annoying nights. 7:15AM Wake-up, after an extremely poorly slept night. My little one was crawling all over me during the night, and I woke up numerous times with a squishy bum sitting on my head. I leave home at 9AM. 10:00AM Thankfully I have taken the morning off - I could not have worked properly anyway after a night like that. I go to a press event about XLS-Medical new weight loss product. 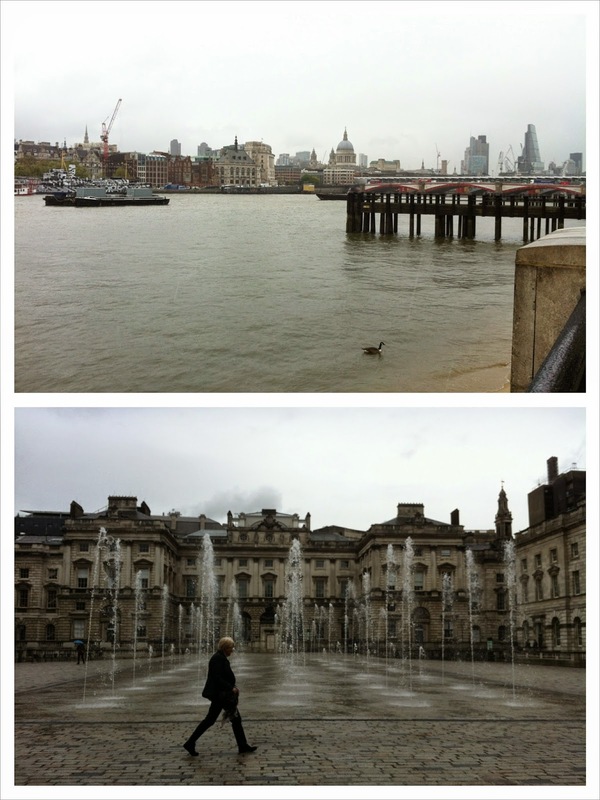 After which I go and see Sony World Photography Exhibition at Somerset House. 2:00PM - 5:50PM I am at work and feeling thankful I will get to go back home soon and rest. Someone has brought a big bag of Hershey's chocolates in and I am finding that resistance is futile. 7:00PM I am back home, and after putting the little one to bed I cook "Sicilian cauliflower pasta" from Meat-Free Mondays cookbook. My husband is the one usually (practically always) in the kitchen, so I am a little rusty, but it works out alright. 12.00PM to bed after putting the washing on. 7:15AM Wake-up. Cuddles with my little girl, getting ready for work, as always in the mornings. I am a bit late and catch the later train at 8:45AM. I am still reading Gone Girl - it is a real page-turner. 9:40AM - 5:15PM I get to work, and feel like most of the day went on doing busywork. For lunch I met a new person over coffee. I've signed up to do monthly networking. The idea is to get to know other work areas and make connections between departments and teams. The guy shows me around his office (which is much fancier than mine) and we grab a coffee and chat about life, career plans and work areas. 6:30PM I left work early as I had a Governor's meeting in a local primary school. Thankfully the school governing meeting is a short one and I am back home at 7:30PM. After eating I get back to reading my book, nearly finished now. 11:30PM I get to bed - hubby is planning to wake up at 6AM tomorrow so better get some sleep. 5:30AM I hear yelping from my daughter's room. She is so loud I can't sleep so bring her in our bed as my husband goes to the gym. I try and cuddle her and sleep, but she keeps on jumping around so eventually I get up at 7:00AM and start making my way to work after preparing my lunch. 9:35AM - 6:00PM I am at work and do mostly various research bits. I go to a seminar on European finances and the macroeconomic trilemma (oh, yes, very nerdy) and go to the gym afterwards to do interval training and abs. I am on the phone with my hubby quite a few times throughout the day as the house sale is just so stressful and the seller hasn't provided the right paperwork and is just being generally unreasonable and we are trying to find solutions. I had been planning to see some folk for drinks in Angel, but feel so tired I figure it is best to go back home. I've finished Gone Girl and grab Love in the Time of Cholera as my next book. 8:00PM I get back home after a long commute with plenty of delays. Put the baby to bed, eat food, blog, read stuff on the computer and drink an ale. Ah, after the week I feel like I really need one. 12:00AM Off to bed - I am knackered! 10:10AM - 11:45AM Some Saturdays we go to a Finnish class as we are trying to raise a bilingual baby. Mostly it is a baby rhyme time type of a group, but this Saturday we are celebrating May Day, which is a big deal in Finland. 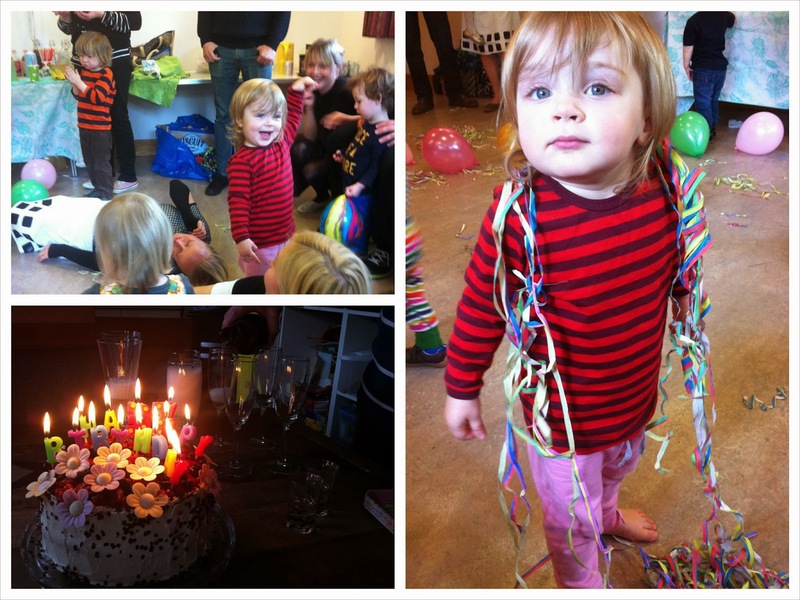 We have some traditional May Day foods, and dance a bit and play with balloons. 12:30PM - 2:45PM After coming back home we put our little one for a nap, and get ready for our afternoon outing. 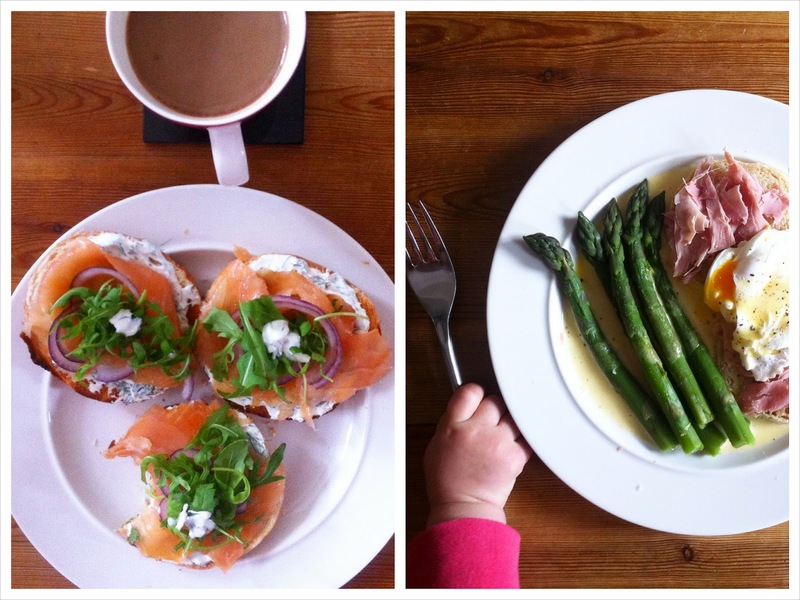 I also write a blog post about my Instagram April and My Monthly Roundup linky. 3:30PM - 6:30PM We are out to see my husband's sister, and spend the afternoon celebrating her birthday. A nice home-cooked lunch, some cakes, and playing in the garden. 8:00PM After a quick supermarket trip we get back home. We don't make any food as we are still feeling stuffed, but Aili has some dinner and goes to bed at 9:00PM. We watch 22 Jump Street, which is hilarious and makes me laugh so hard I almost cry. 12:00AM Off to bed after loading the washing machine. 6:20AM We get woken up by the little monkey. Desperately we try to cling into the last dregs of sleep by bribing her with an iPhone, but we forgo the losing battle at 7:20AM and get up to have a leisurely breakfast, with lots of coffee. 9:00AM - 11:30AM It is raining, so we stay indoors, watch telly, sing nursery rhymes, read books, and relax. 11:30AM - 2:30PM The little one is having a nap, I hang laundry, on the computer reading and doing a bit of blogging related stuff, and I make us Eggs Benedict for lunch. 2:30PM - 6:00PM After waking Aili up, she refuses to eat, so at 3:30PM I take her to the nearby park. 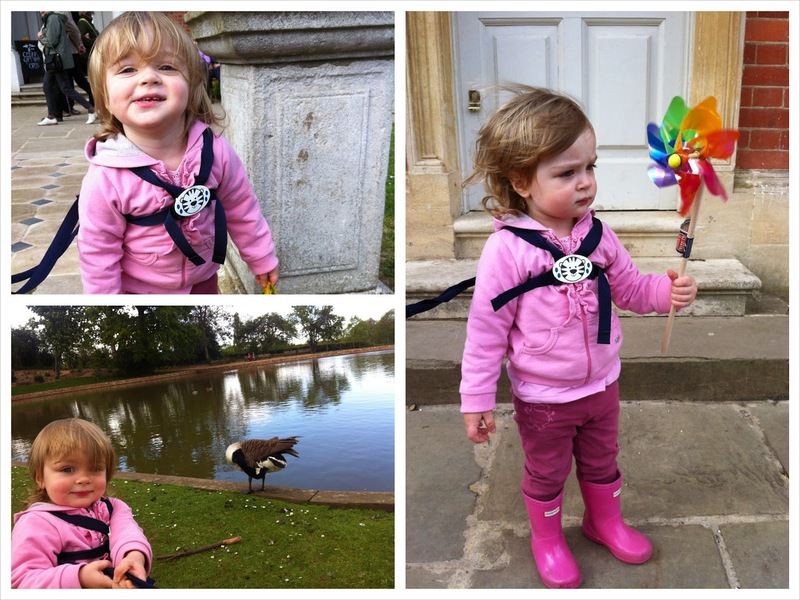 There are geese, ducks, a mansion house, and we walk around the place and I get her a whirly windmill. 6:00PM - 6:30PM We have a Skype chat with my parents, who live in Finland. Aili is engrossed in Peppa Pig so we talk about the house and what to do with the problems and I have a good moan about the whole house buying business. 6:30PM Aili has some dinner, we give her a bath and put her to bed at 8:00PM. Then we have food, watch telly, I do a bit of linky maintenance and read stuff on the internet. 12:00PM We are off to bed, thankful it is Bank Holiday the next day. Loving a long weekend, and we have planned to go to look at kitchens in the morning and go out for a picnic in the afternoon. If you fancy doing a similar post yourself why don't you post the link in the comments or in the one-off linky tool so I can pop in by too! P.S. I've done a 24 hours in the life of a newborn before, which was a fun post, if you want to check that out too. It really is busy being a working mum, there is always something to do. Thankfully my husband is a stay at home parent, otherwise it would be absolutely manic and non-stop I think. It was a pretty full on week with lots of different events too. Usually it is slightly more routine than this, which makes it a bit easier I suppose. It definitely feels like a treadmill sometimes. Or like a hamster wheel. But I guess in a way it is nice because I certainly get to experience lots of things! Work life balance is definitely difficult to achieve. It often feels like there is also so many things to do home, as obviously when you're working you can't do those little maintaining jobs and sorting stuff out as easily and it just piles up on your weekends. This sounds very familiar I do compressed hours, full time in 3 days more or less so I am usually meeting myself coming back! Eating breakfast and doing dishes! Making Dinner, walking dog the usual! Wow, compressed hours must be tough! I did think about trying to do compressed hours, but currently work normal office hours as it feels a bit tricky to organise that at work. Not to mention that I am not sure if I was able to do very good work as I'd be knackered. Hats off to you! Wow I am in awe. I work part-time and still feel rushed off my feet with all I have to do. You seem to be so organised! Well, as much as I would love to take all the credit, it does help immensely having a stay at home partner so I don't need to worry about childcare, and I hardly ever need to cook... Would be much more difficult for me if my partner worked as well! Yeah I was sort of surprised how much I've managed to pack in one week, it feels like a lot on paper. It wasn't quite that bad in reality although of course pretty busy. Stay at home partners are amazing aren't they! Wow, you do have a busy week! I have just started back at work full time. I feel like I am ten minutes late for everything and always playing catch up. I feel like I don't have enough time to do a good job at work, I miss my son terribly and I don't have time to do things like cooking, cleaning and generally just getting my life in order. That's life though and that is the way it has to be! Bring on a holiday. Even if it is just a staycatation. My partner stayed at home with my two and I went back to work when they were small. My two are much older now, and I'm only really just grasping that doing a full time job outside the home doesn't change that once you have children you are a full time mother. Well done for working it out and working it through, and good luck with the house move. (PoCoLo). It was a surprisingly busy week. It does make it so much more difficult to juggle if your partner has a job too, and especially if their work days are long / difficult to move around. I work in an office so can take flexitime if I really need to. That's interesting you say your kids need you even then, just in different ways. I've heard that before as well. You do think they need you less, but even as teenagers and even as adults I guess you still rely on your parents a lot.